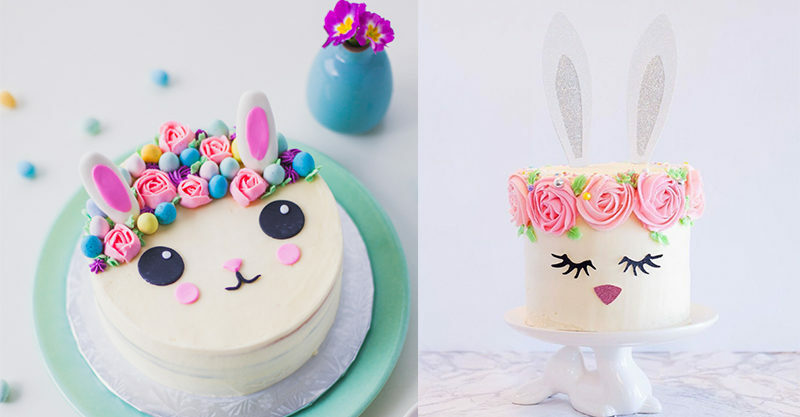 These Easter Bunny cakes are a delight to behold and have convinced us we’ve been missing out Easter cakes all these years – and need to make up for lost time, stat! Instagrammer Lyndsay from CocoCakeLand is the genius between this beautiful bunny, and she’s kindly shared a how-to on her blog so we can all sweetly bunny along too! The Sprinkle Sisters whipped up this sleepy bunny cake and honestly they make it look so gosh-darned easy! Head over to their blog for a tutorial and lots more Easter baking inspiration. Baking whiz Gordicesdamah created this pared-back, more grown-up incarnation of a bunny cake, and it’s proof that you really can do elegant rabbit ears! Mama’s Cakes took the sleepy bunny cake concept and amped up the lashes and fragrant blooms. The results are super cute and we especially love the glitter ear twist! Printed bunny face stickers and gingham-trimmed ears transform these cupcakes into the cutest Easter squad we ever did see! Instagram baker adocevidadaneila is the clever cookie behind these cute guys. Heather of Instagram account foodgalleygab is not swayed by the fancy bunnies of late. She’s taken things back to nostalgic basics with this coconut and lolly-strewn perfection – and we could not love her any more for it! Find the recipe for this cake on Heather’s blog. This very cosy bunny was created by baker Valentina Cappiello. It’s a more traditional bunny, which makes it extra adorable! You can find the recipe – translated from Italian – over here. Now all that’s left to do is choose which one to make – and bake your family an even more delicious and bunny-filled Easter!